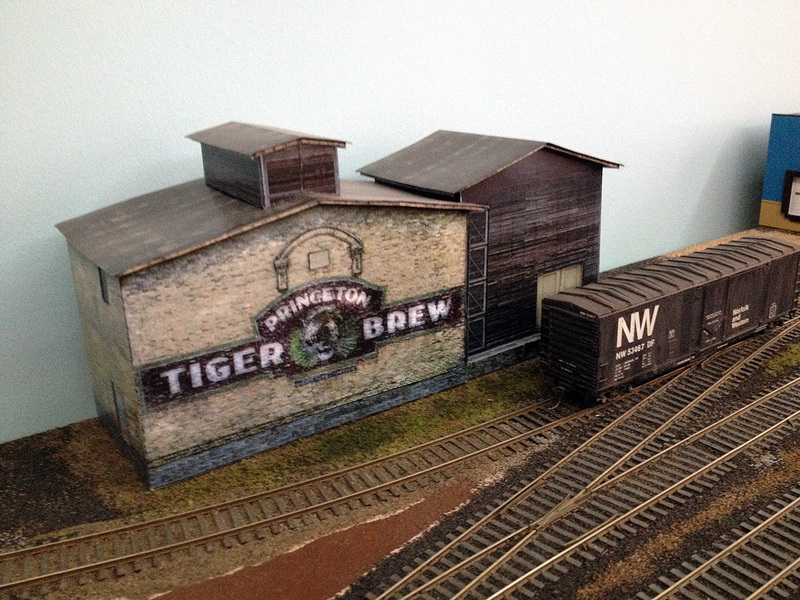 In the last few years I have returned to the hobby of model railroading. 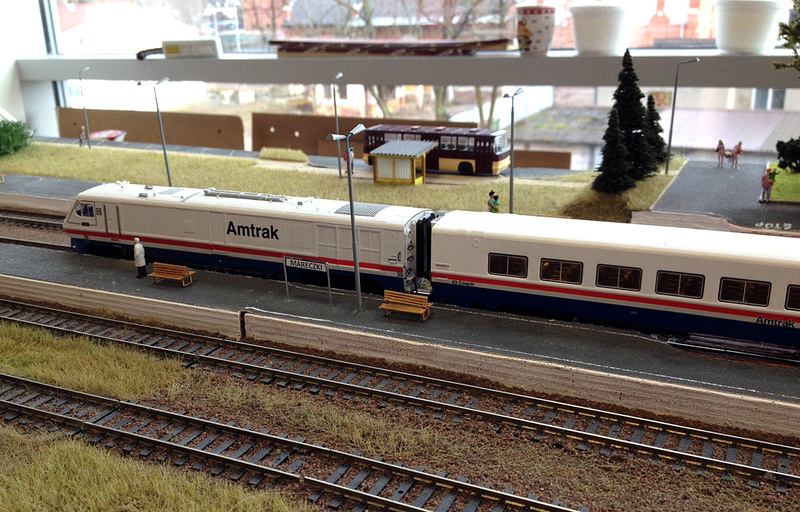 A change of apartments in 2012 finally provided me with room for constructing a layout, and about the same time I became involved with a modular model railway club in Toruń, Poland, and have been attending their exhibitions. 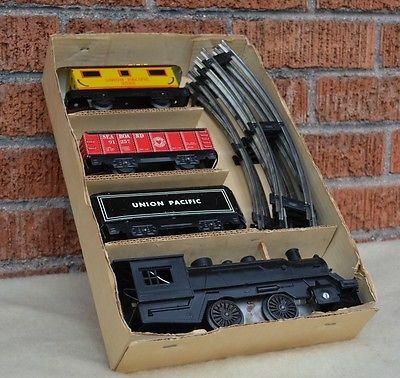 So, with Christmas just around the corner, and its many connections to trains, it’s an appropriate time to look back through the years. Did I ever get a lot of fun out of this set! Over time I added more track and even some Lionel accessories. It served me faithfully right up until junior high school, a period of about 7 years. I entered the 7th grade in the fall of 1977, and one of the new friends I met in the new school was Dale Pape. 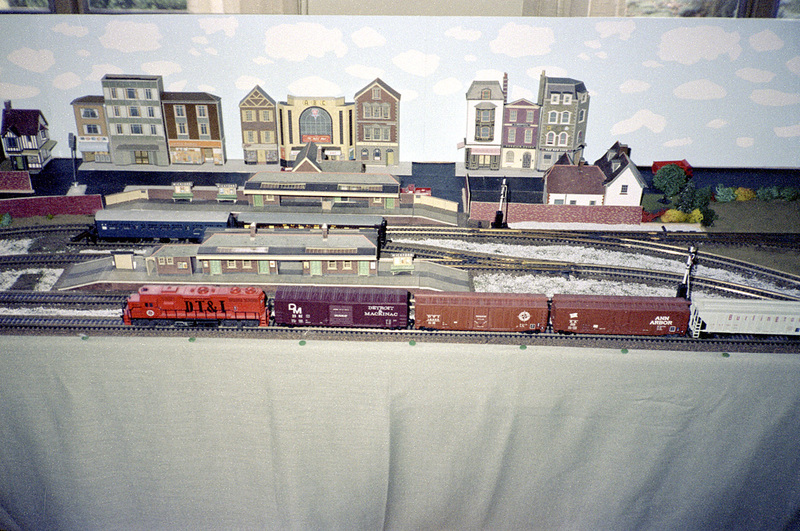 Dale had an HO scale layout at home, and it was a wondrous thing. He had number of cars and locomotives, two main lines, tunnels and mountains. I found out you could easily buy HO scale cars in a store. 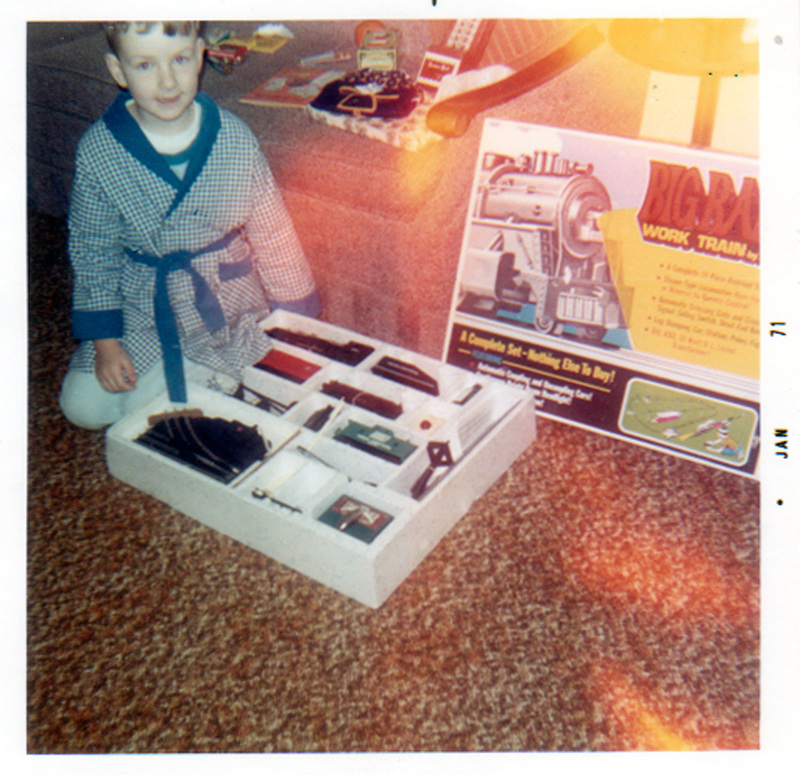 With my Marx train, I was limited to what I had, as Marx was out of the business by then. Time for a change! 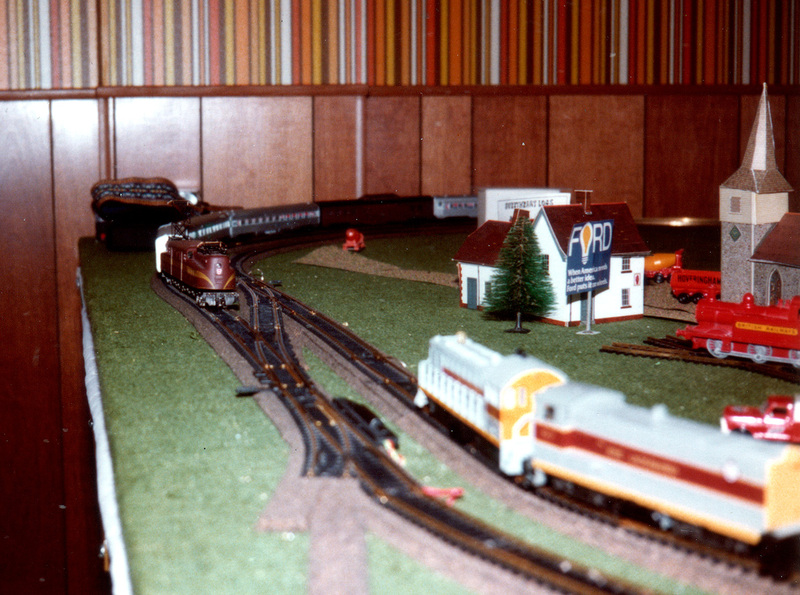 This small layout was actually taken for a weekend display at the mall in Adrian, Michigan in 1978. Even though it was only a basic layout, it attracted a lot of attention, and I decided that a larger layout, built for exhibition, would be a good idea. 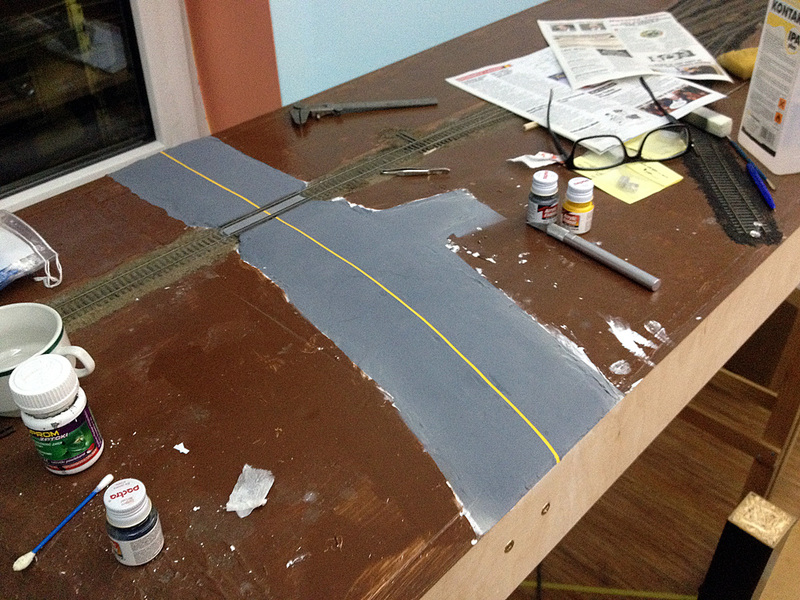 So, the tracks came up, the 4×8′ board was cut in half, and work went ahead on an exhibition layout. My exhibition layout was 24′ long and 2′ wide, but with a 4×4′ turning loop at each end. 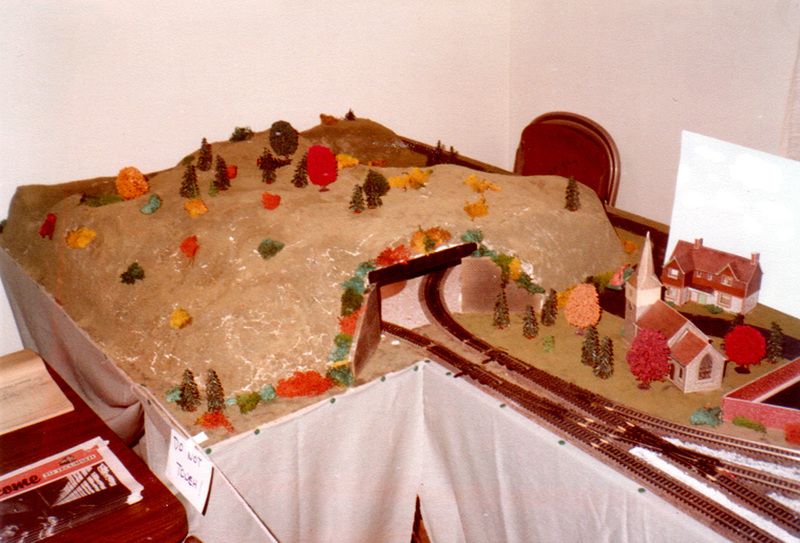 Thus there was only one running track, but the longer center part of the layout appeared to be a double-track railroad. The turning loops at each end were in tunnels, which did lead to problems in case of a derailment! 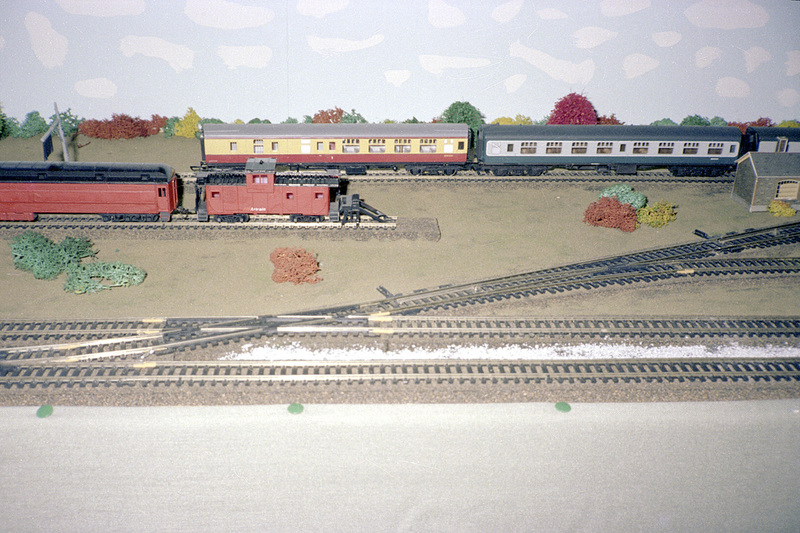 The main lines ran along the front of the layout, and behind them there was a (British) passenger station and high street, and also a freight yard. 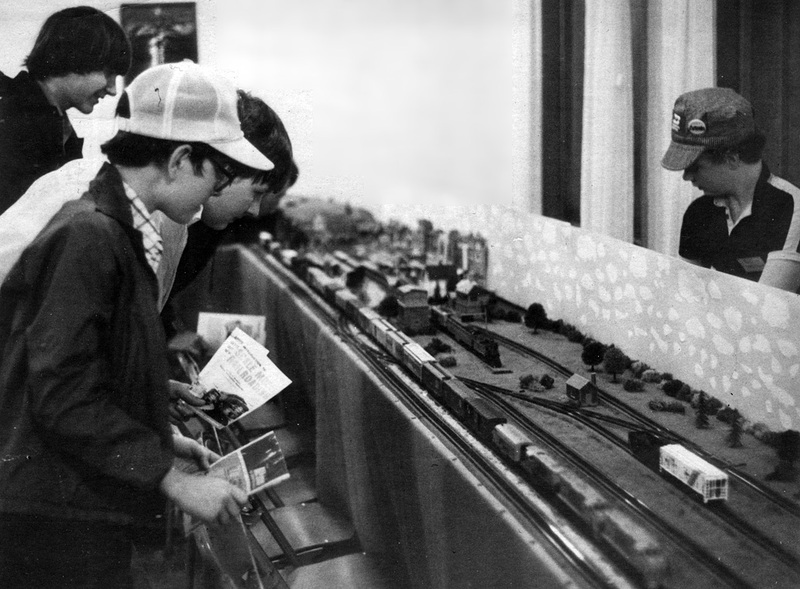 The layout had its first public exhibition in April 1980, when the Michigan Artrain came to Tecumseh for a visit. The Artrain was a mobile art gallery housed in old railroad passenger cars. In Tecumseh, it was parked on a siding behind St. Peter’s Episcopal Church, and the church hall was used for a community arts festival. I was given a room there in which to display my layout. The layout was set up for the weekend, and together with friends from school we operated it all weekend long. 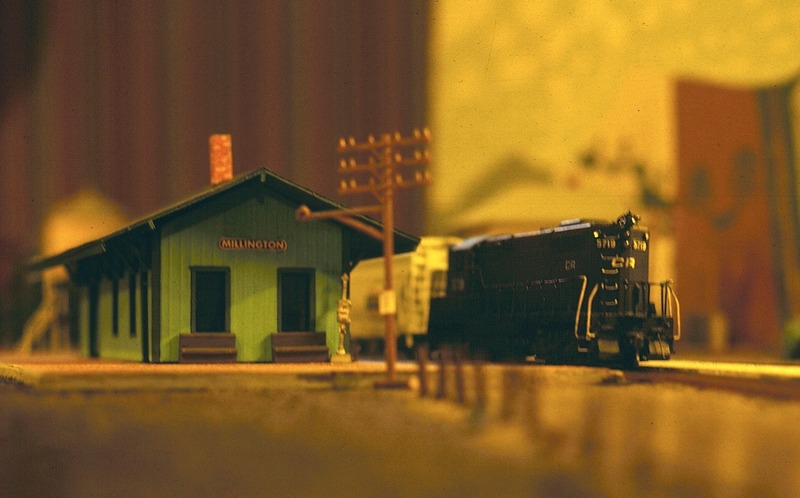 During the weekend a lot of new friendships were made with local railroad enthusiasts and modelers, and it soon led to the formation of a local club, the Lenawee Area Railroaders. This later became the seed for the Southern Michigan Railroad Society. 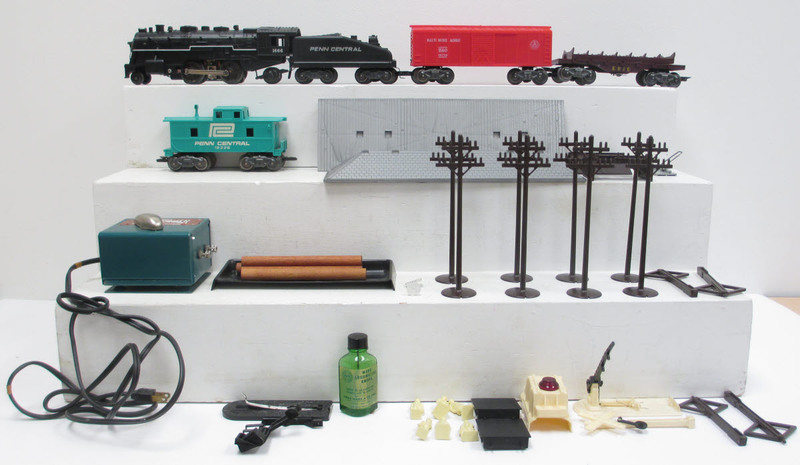 The freight yard on the display layout. Many cars still had horn-hook couplers. 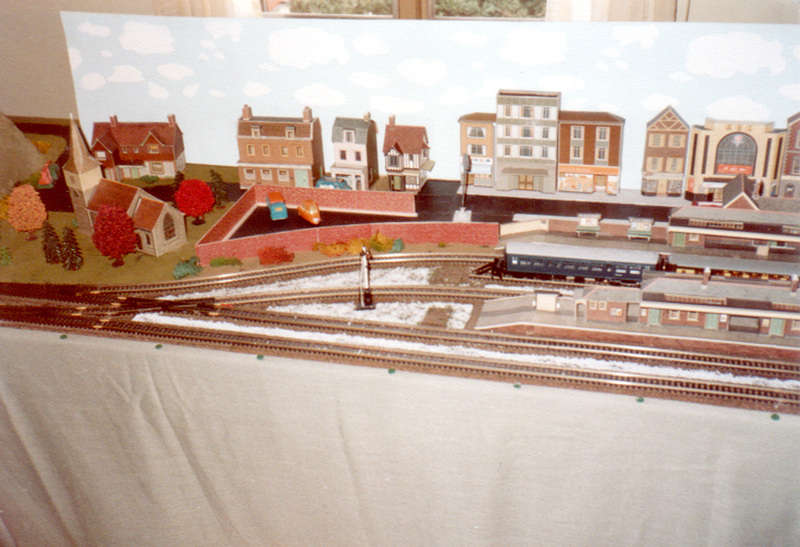 This is the center of the layout. A freight train is passing on one of the main lines. In the foreground are the mainlines, while in the back there was a track connecting the station with the yard, and two British carriages sit here. Also visible is a “mini-Artrain”, made by Dale Pape. 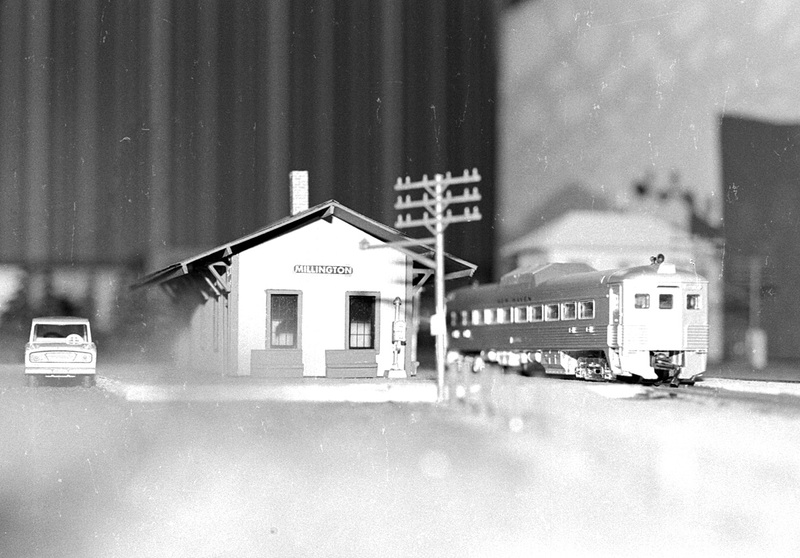 The key feature of the layout was the passenger station and town, all in British style. A DT&I freight train passes! The far end of the town, and the village church. The turning loop, hidden in a tunnel. My scenery skills have improved since this time! A “publicity” shot from that weekend. 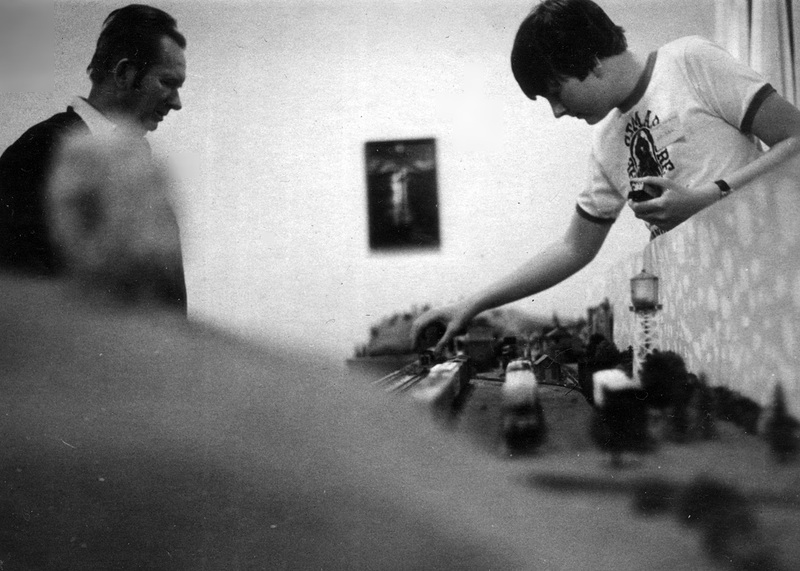 Dale Pape, the blog author, and Terry Bush look over the trains as Brad Barritt mans the controls. 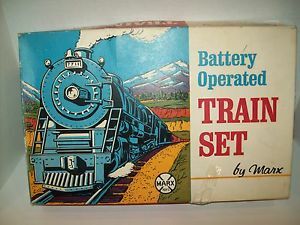 The blog author sets comes cars on the tracks as his father, Stanley Dobek, observes. Thanks, Dad, for your help and patience with me and my hobby! This layout had more advanced scenery and tracks than the British-American layout, and you could run long trains, but operationally it was rather unexciting. It never did go on exhibition and slowly fell into disuse in 1982-3 as I became more involved with real railroading at the Southern Michigan Railroad Society. 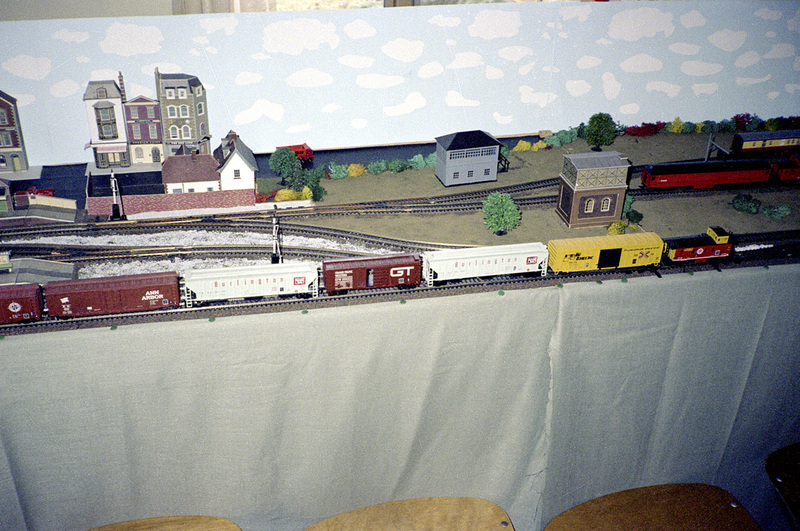 In 1986 or 87, I gave the layout to a friend. The locomotives and cars went into storage. 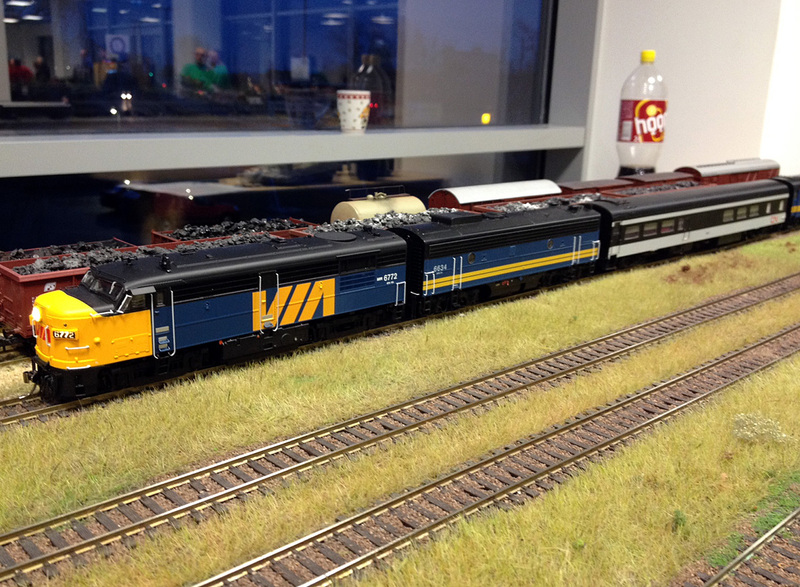 In St. Louis I also belonged to the local chapter of the European Train Enthusiasts, who had a small modular layout. This was occasionally displayed at train shows, and I was able to run some of the European equipment I’d picked up on my trips to Europe. 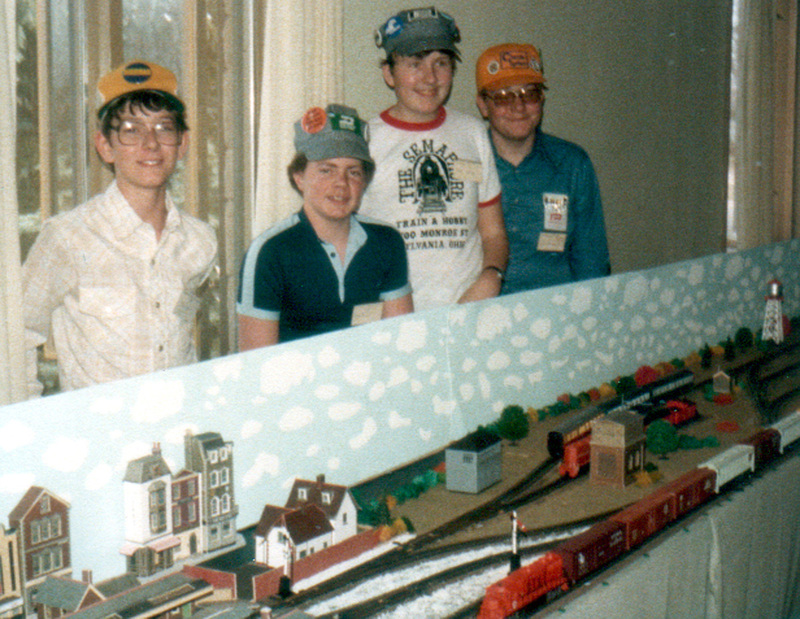 I also belonged to a model railroad club in Webster Groves, Mo. which had regular Thursday operating sessions. 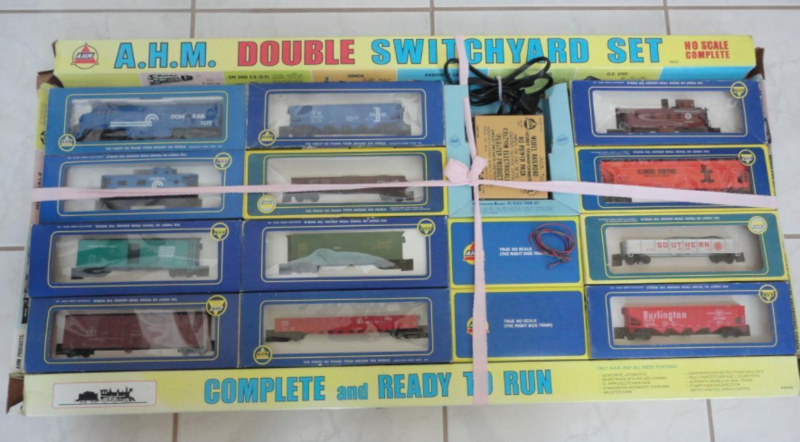 When I moved to Poland in the late 90s, I sold many of my locomotives and cars on eBay, but maintained a small collection of my favorites, which I sent to my new home in Europe. Some of these were displayed in small case mounted on the wall. About 2010 a friend introduced me to a relatively-new model railway club in nearby Toruń, Poland, which had regular modular meetings (Toruńska Makieta Modułowa). A visit to one of their meets fired up my enthusiasm to have a layout again. My initial plan was to build 2 switching modules, but a move to a new apartment in 2011 finally gave me a spare room that I could use for a permanent layout! 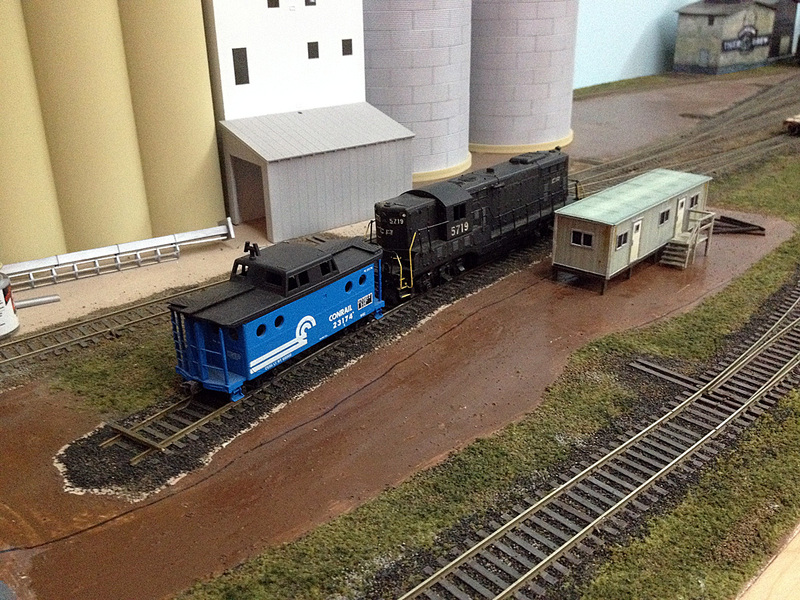 Since the move, I have incorporated those two modules into a much-larger “L-shaped” switching layout, inspired by Doug Leffler’s “Lenawee Central Railroad”. The plan is to recreate a fictitious New York Central/Penn Central/Conrail branch line, based on the lines which existed in Lenawee County, Michigan, where I grew up. There will be a number of industries to allow extensive switching. 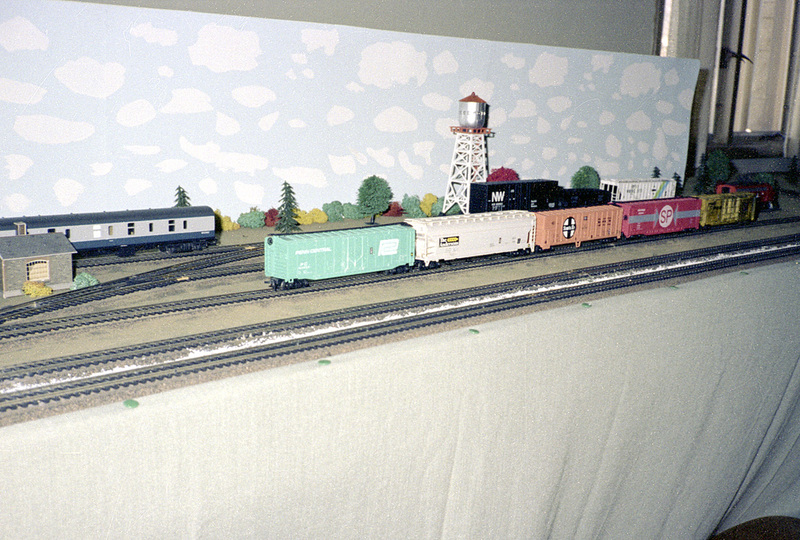 A short track and “crew shanty” for the switch crew on my home layout; note locomotive CR 5719—it appears in the 1981 photo above! 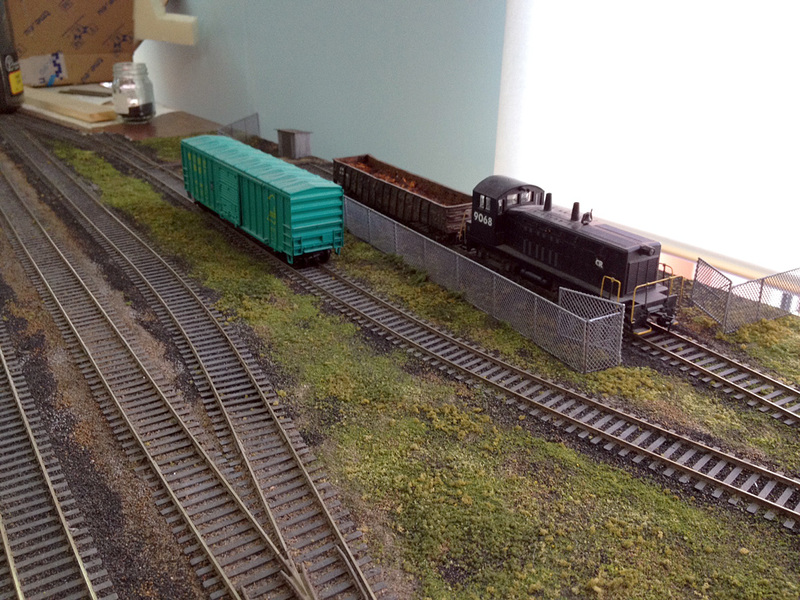 CR 9068 switching the scrap yard on my home layout. There’s that HCRC boxcar that appears on the 1995 photo above! As construction continues, I attend most exhibitions of the TMM. I don’t have any modules, but they are tolerant of me running my American and Canadian equipment on their Polish-themed layouts! 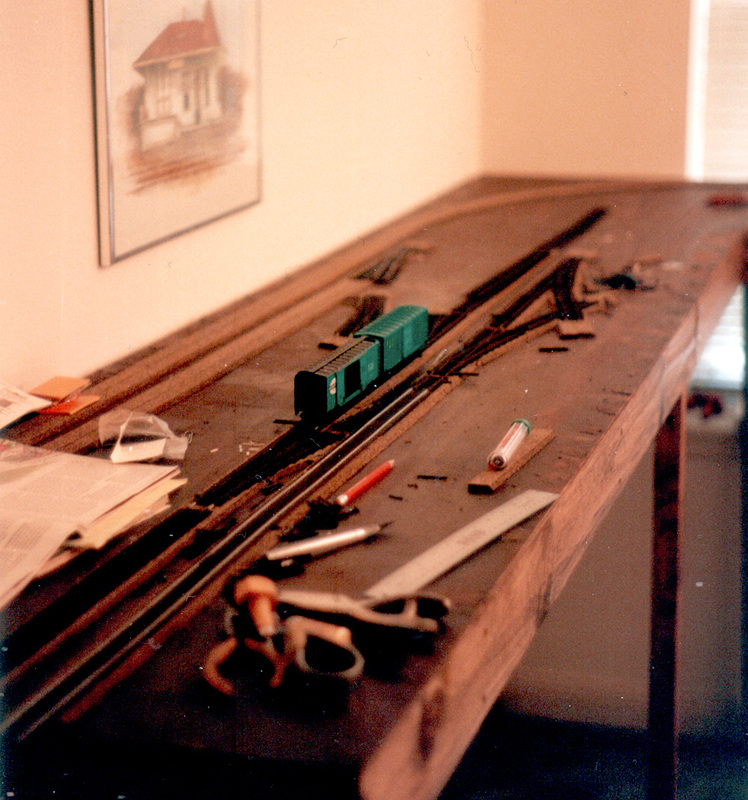 The model railroading “bug” I have had since I could barely walk remains with me today. My layouts have changed through the years, and I’m always learning new techniques and skills. My current layout is enhancing my scenery techniques, and I am learning to construct complicated building kits. I’m also learning to use DCC digital controls which were unimaginable in the 1970s. I hope that I have many years ahead of me in this hobby, and look forward to getting my home layout finished to a level that will permit regular operating sessions. Great trip down memory lane. Hope all is well and wishing you the best of Holidays Jeff. All the best to you, Garry! Nice to hear from you!